An in-depth look at the struggle for immigrant worker rights; we’ll speak with Rene Salcedo about the struggle in California against the reactionary policies of gubernatorial candidate Jerry Brown and many others; we’ll be joined by national board member of NDLON, the leading national organization for day laborer rights and immigration reform; and we’ll take a look at youth organizing on the ground in Arizona with an activist who spent the last three months on the ground; and Flashpoints en Espanol. 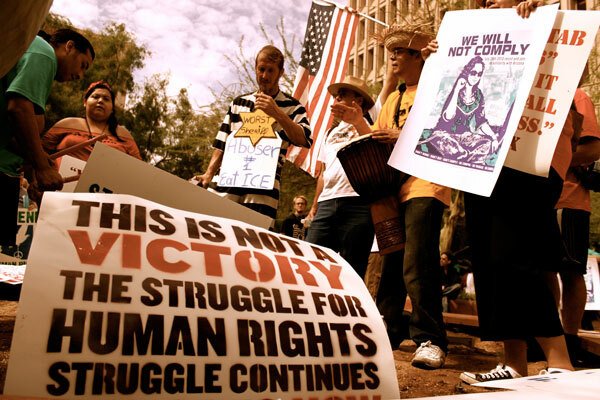 THIS WEEK ON THE BEST OF FLASHPOINTS, THE CREW REPORTS FROM ON THE GROUND IN PHOENIX ARIZONA AS THE RACIST SB1070 TAKES EFFECT – WE’LL HEAR NEWS AND ANALYSIS ON HOW THE FEDERAL JUDGE’S TEMPORARY INJUNCTION AGAINST PARTS OF THE LAW STILL OPENS THE DOOR FOR ABUSES AGAINST THE PEOPLE IN ARIZONA. Click HERE to access the show from Radio 4 All. We’ll feature two of the leading voices in the movement against SB1070, who were both arrested yesterday in Phoenix; also, we’ll be joined by Evelyn Sanchez with a report on the widespread actions that took place in the Bay Area yesterday, especially in San Jose; we’ll speak with filmmaker and journalist Martin Rosetti about his arrest and the attempt by Phoenix authorities to restrain journalists; and we’ll have more sound from yesterday’s peaceful protest against SB1070 in Phoenix. 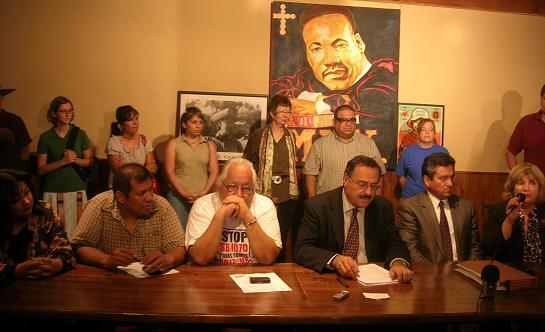 We bring you special coverage of the beginnings of Arizona’s Senate Bill 1070, live from Phoenix, Arizona; we’ll be speaking with three major Arizona organizers: Pablo Alvarado, of the National Director of the National Day Laborers Organizing Network, Tupac Enrique Acosta, Director of Tona Tierra, a social cultural center for indigenous and Spanish speaking communities, and Salvador Reza, Director of Puente Arizona; with them, we’ll go in depth on today’s judicial decision which gives a slight game-changer for SB1070, at least for the moment; we’ll also speak with some young Arizona activists who have been fighting the racist law for months. Activists fighting against Arizona’s new racist anti-immigrant laws prepare to converge on the state next week for a national protest. Meanwhile momentum grows for the movement calling on Major League Baseball to move next years All Star Game out of Arizona. Also, an in-depth, update on the worsening situation in Haiti, including a report on a Lavalas Protest of over 10,000 people that went totally unreported by the mainstream and alternative press. It’s a muddy cell phone video, taken from a difficult angle, but the audio recorded on the modest device, is both revealing and chilling: the contents cast doubt on claims by the U.S. Border Patrol, regarding the death of a Mexican national who died in custody after being beaten and electric-shocked by federal agents on May 28. 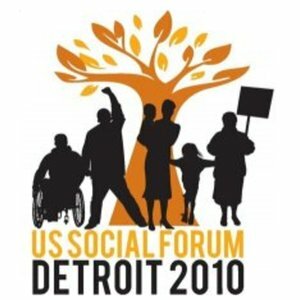 We have part one of a special report on last week’s US Social Forum in Detroit, where tens of thousands of beautiful activists, organizers and people who are simply sick and tired of being sick and tired, came together to network, strategize and create local, regional and national goals. 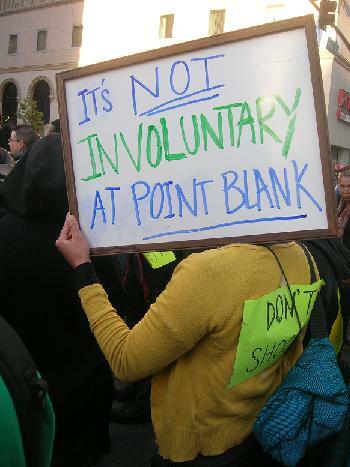 On today’s special, we’ll hear testimonials about the devastation occurring in people’s communities around the country; also, we’ll hear about a new exciting domestic workers’ alliance that’s been built at the US Social Forum; finally, we’ll end the show with Radio Flash, that is, Flashpoints en Espanol, also featuring sounds from the US Social Forum in Detroit.